Prior to embarking on a cruise in the Galapagos, many tourists choose to spend a night or two in Quito, the capital of Ecuador. The historic old town is a cultural hub with narrow streets, centuries old churches, colorful balconied houses, restaurants and lots of people. Since I had never been to South America before, I wanted to get a taste of this city and the Andes Mountains. San Francisco Cathedral in Quito, Ecuador. 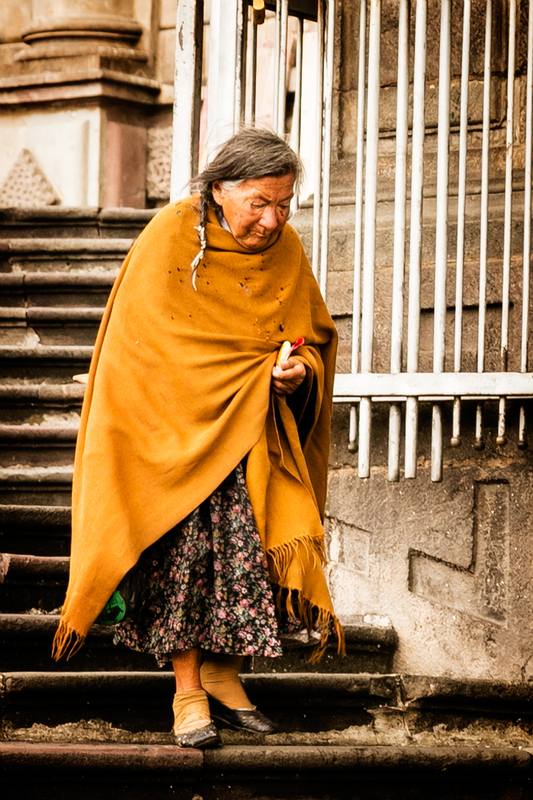 Quito sits at 9,000 feet elevation so you may want to check with your doctor about altitude sickness before traveling. Most folks don’t have trouble if they take it easy and drink lots of water, avoiding alcohol. 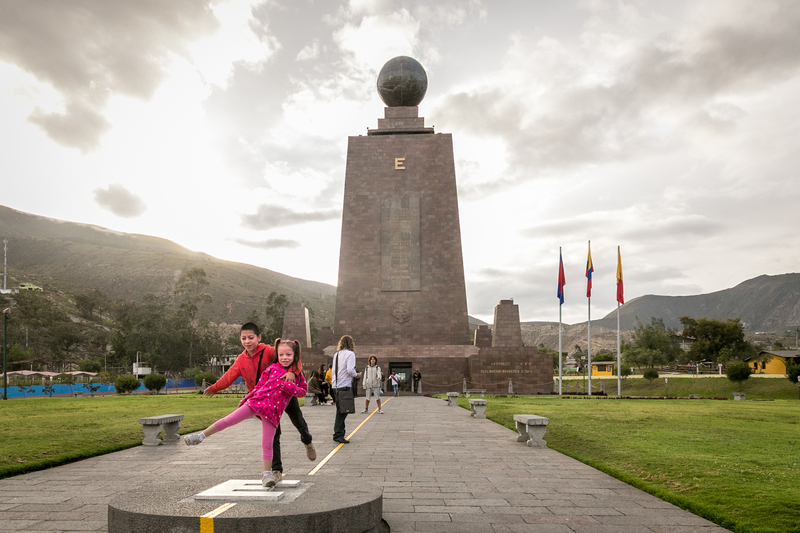 Getting there is easy, as flights from Miami to Quito take just three and a half hours and the clock remains in the Eastern Time zone. (Flights from NYC take about five hours.) I arrived in the late evening and arranged for a pre-paid taxi driver to meet me and my companion at the baggage claim area. He drove us to Boutique Hotel Maisón de Angel, my online lodging choice that turned out to be fabulous. The hotel was the former home of an Ecuadorian tobacco tycoon. 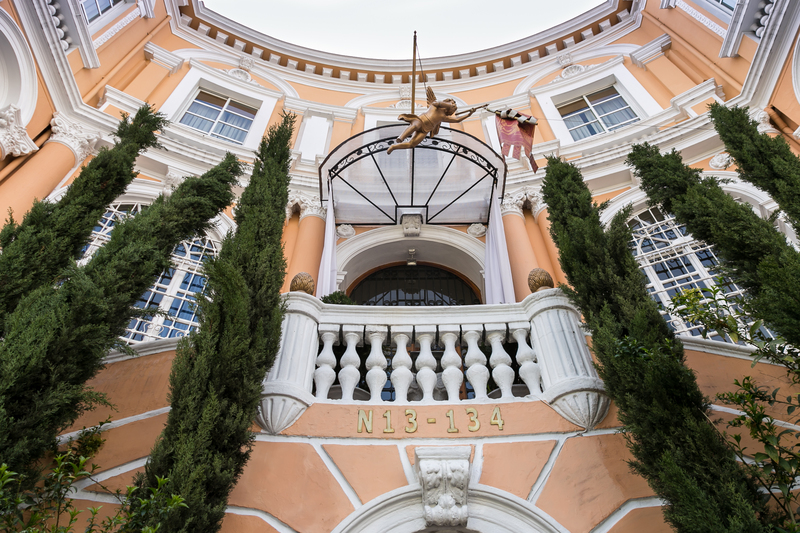 Guests climb up a two-tiered staircase in front of the salmon-colored facade to enter the opulent lobby, filled with paintings, chandeliers and a corner office for the staff. (Climbing stairs is where I felt the altitude; I quickly became breathless.) The staff was very helpful answering our questions (in English), booking taxis and speaking to the driver to confirm plans, and allowing us to print boarding passes. Our spacious suite felt luxurious as did the very comfortable beds and deluxe sheeting and comforter. 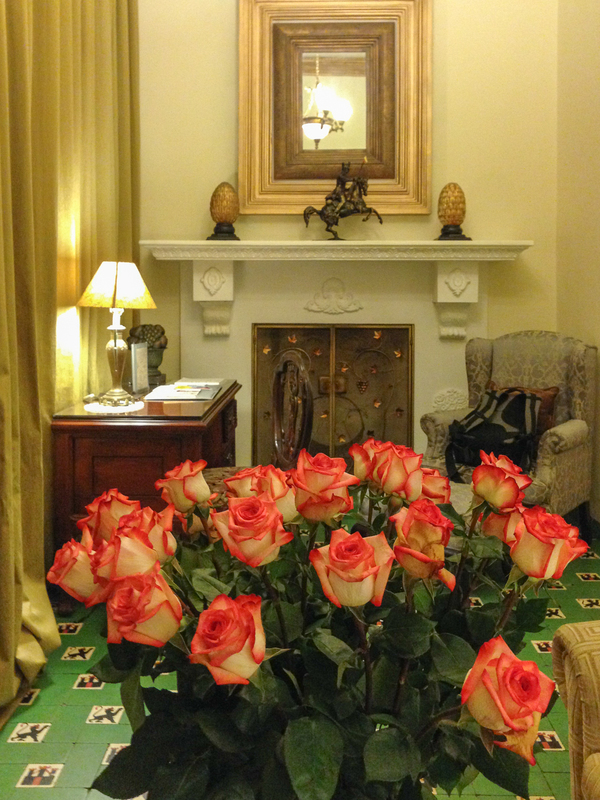 The tiled sitting room was arranged with a chair, desk and sofa that faced a coffee table accented with a vase of 12 fresh long-stem roses. One end of the sitting room featured a fireplace and mantle, while a large and modern bathroom sat on the opposite side. 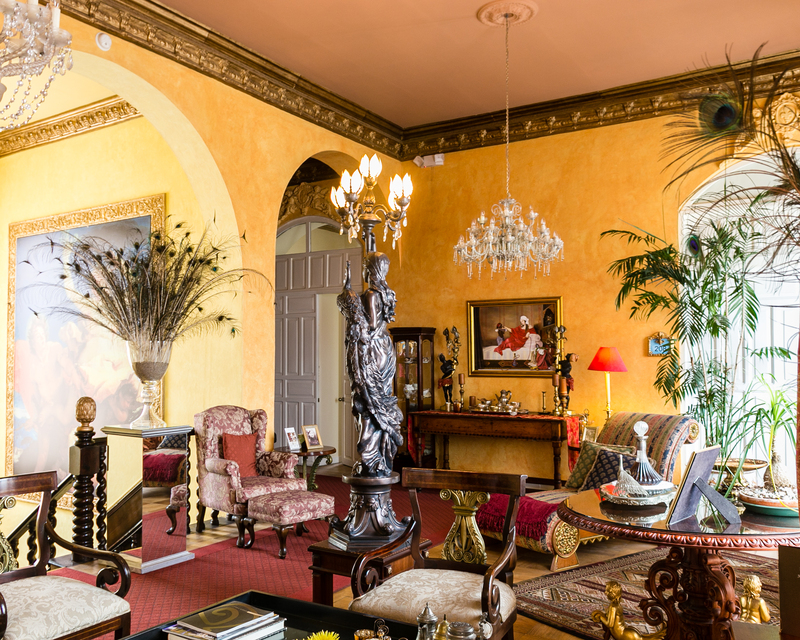 We were out touring when the complimentary afternoon tea or wine was served in the upstairs salon. However, we later meandered there to see the ornate second floor lobby and have a look out the windows at the cloud-shrouded Andes Mountains. I also peeked into some of the other rooms and took photos as the bedrooms ooze decorative charm and character. Breakfast is included in price of your room, and the small dining area felt like an aviary; birdcages housed live birds that filled the air with melodic song. A breakfast buffet offered typical continental items, including deli meats and fresh croissants. A waiter took orders for eggs and bacon or ham making it a full English spread. Organic Ecuadorian coffee made my morning. Following the meal, we were met by a guide and driver from Destination Ecuador/ Tropic Journeys who offered to introduce us to Quito. 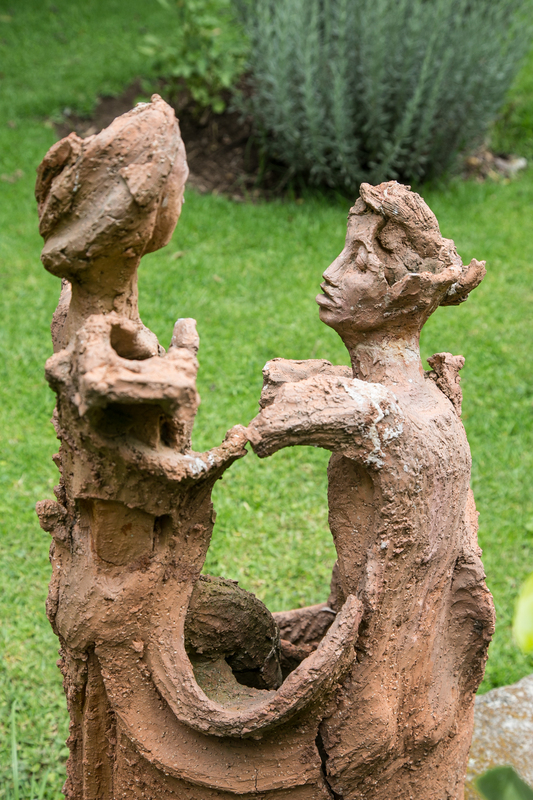 We began by driving out of the city to sculptor Sara Palacios’ home. Sara, a most gracious host, welcomed us in her Spanish Colonial style house. Oh my, what a gem it is. Ms. Palacios is a renowned Ecuadorian artist who combines the expressive form of her sculpture with poetry, drawing and video art. Her work has been linked to more than twenty years of research in Quito’s Colonial Art. She explained how she used significant works in the historic area as creative stimulation for her own projects. Her angel statues are stunning. 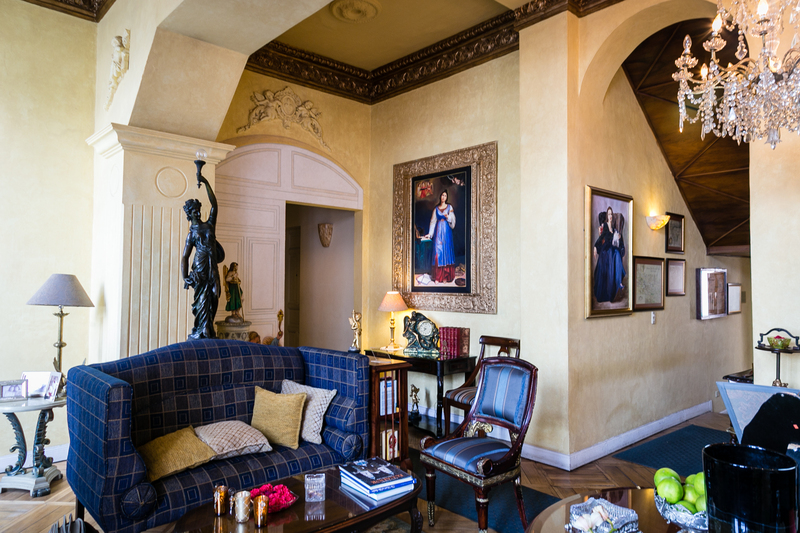 We entered the house through a sunlight gallery that is often used for social gatherings but which currently displays pen-and-ink drawings by Pilar Bustos and a grand piano. Artists for the rotating gallery are selected by Sara based on their quality and expressive power. We then followed her out the back door into tiered flowering gardens bursting with plants endemic to the area: colorful shrubs and carob, walnut and fruit trees. 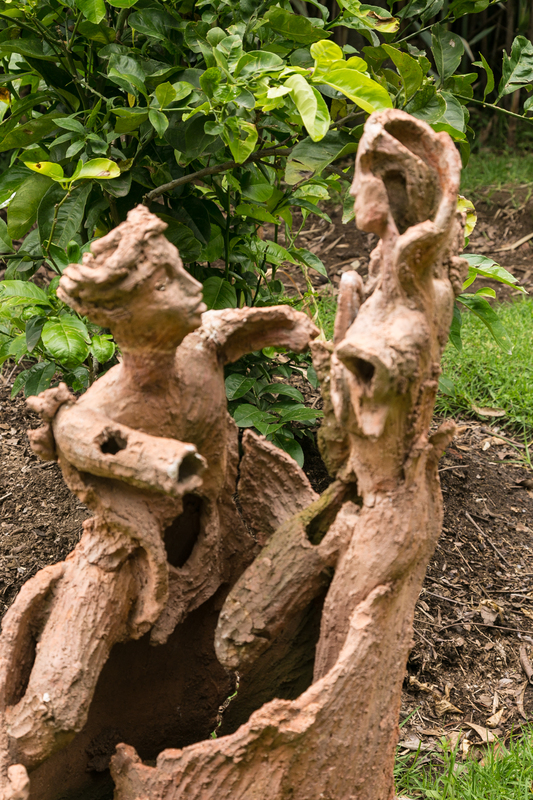 As you stroll around the yard you encounter Sara’s statuary, ranging from formal to some humorous works. Her commentary provided an inside peek into her personality and artistic style. Following a snack we drove into the historic colonial quarter of Quito for a walking tour. We had the exceptional honor of having Sara and her husband join us (though this is not typical). 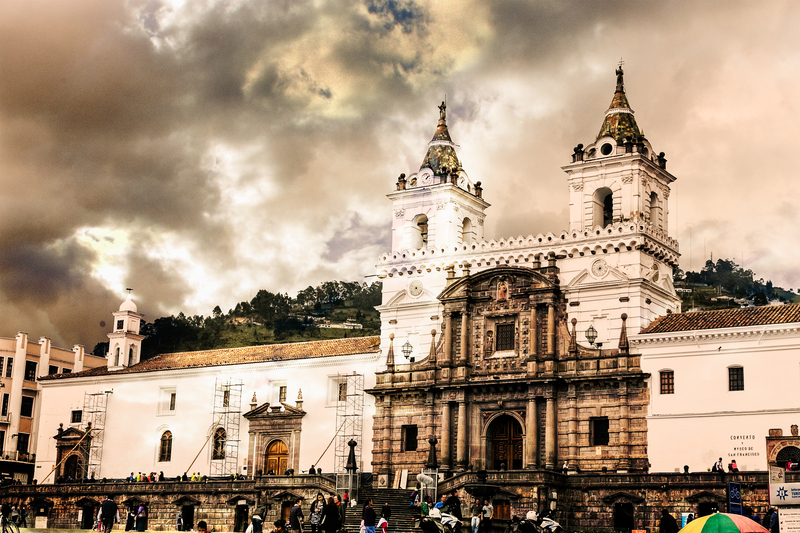 Quito is one of the most well-preserved Spanish colonial cities in South America and should be an essential part of every Ecuador trip. The city was recognized in 1978 as a UNESCO World Cultural Heritage Site and its narrow cobblestone streets lined with whitewashed walls and historic churches certainly made me understand why. First stop was the San Francisco Cathedral and Monastery, a huge Roman Catholic complex with an equally large plaza begun in 16th century. The property encompasses nearly seven and a half acres, including 13 cloisters, three churches and a large courtyard. The main church interior houses about 3,500 works, including priceless paintings, sculptures, altars and chapels. We walked down the central nave with its high ceiling and transept supported by four main columns. We found chapels on either side, each laden with silver or gold candlesticks and beautiful altarpieces. We didn’t stay too long because of a tight schedule, but I could clearly see Sara’s inspiration for the Madonna statues she had shown us in her home. I felt privileged to gain an insightful connection between the past and present art works and Sara’s ongoing creativity. 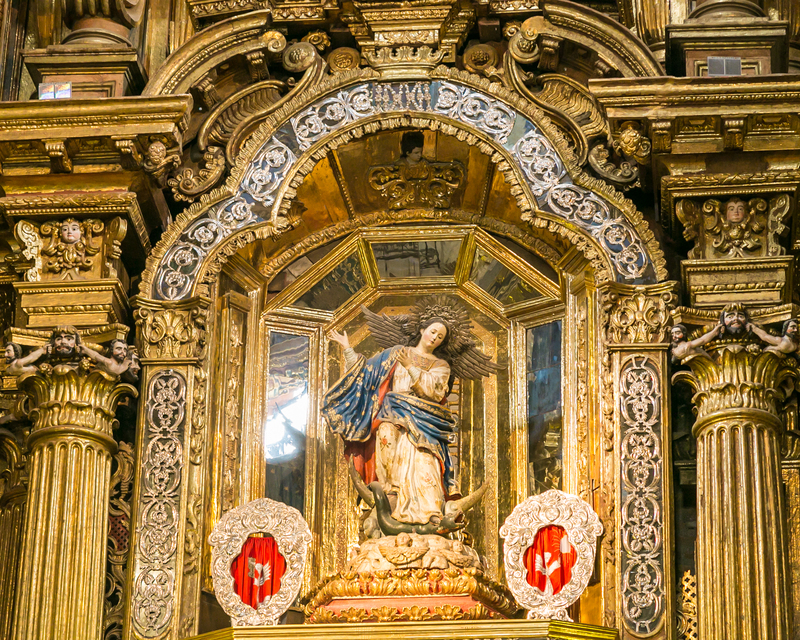 Next we stopped into La Compañía de Jesús, Ecuador’s most beautiful church, paying a nominal $4 entry fee. This UNESCO Heritage Site does not allow photography, which forced me to stand and pause in its breathtaking beauty. They say seven tons of gold leaf was used to gild almost all surfaces on the walls, ceiling and altar. The wild extravagance is overwhelmingly gorgeous to behold and the dazzling Baroque richness gives a sublime feeling of warmth. The Jesuits began building this church in 1605 and it was not finished until 1765 — coincidentally the same year the Jesuits were expelled by the Spanish. The somewhat drab colored facade (compared to the interior) features carved volcanic stone, twisted columns and Corinthian pillars by the side doors. The cornice forms an arch over the main door, and contains a niche with a statue of the Virgin, surrounded by cherubs, angels and saints. What made La Compañía even more special was the fact that Sara and her husband were married there, another personal link that made this tour so unique and memorable. Upon exiting this church, we walked down the Calle Garcia Moreno or the Street of Seven Crosses to the Plaza Grande or Plaza del la Independencia. Unfortunately the skies opened with pouring rain and we weren’t able to enjoy the plaza to its fullest. And, we had to get back to the hotel for a quick change of clothing and an afternoon journey to the middle of the earth! 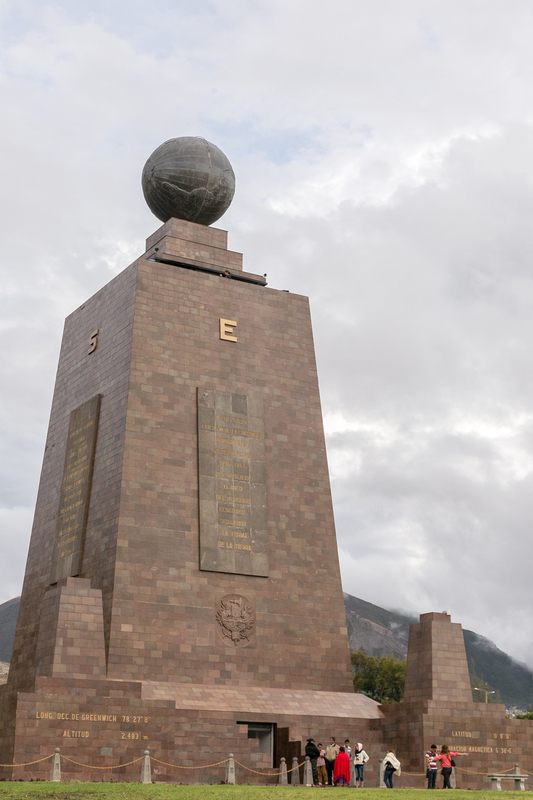 No, we weren’t going to Frodo’s Middle Earth or taking Jules Verne’s journey to the center of the earth, we were headed to the Mitad del Mundo, the Middle of the World and the monument that marks the equator and contains the GPS latitude coordinates 0-0-0 . For that reason alone, I just had to go! We arranged for a taxi to take us to the attraction, about an hour north of Quito. The roads were flooded on the drive, but the sky miraculously held back when we made our stop. 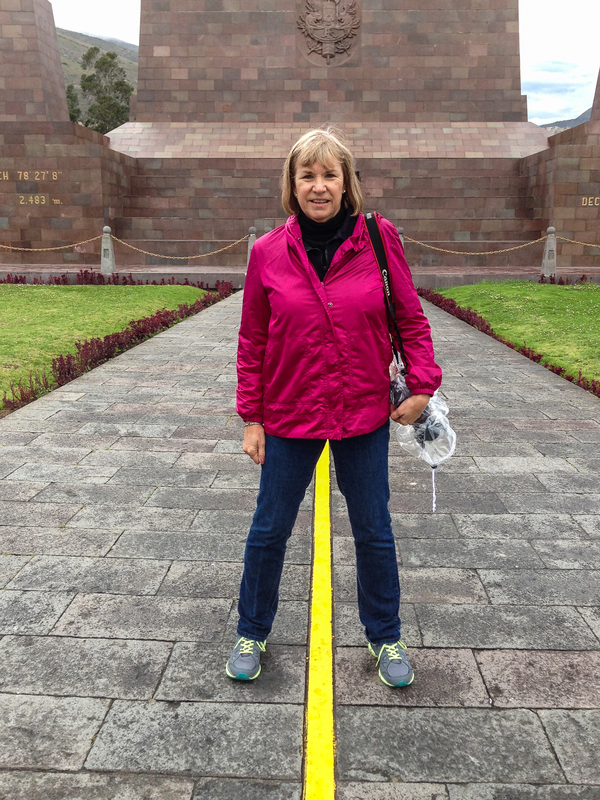 Here, we posed for the mandatory photo op while straddling the equatorial line and placing our body in two hemispheres at the same time. Everyone does it and seems to have a good time. I was pleasantly surprised that the site was less touristy-tacky than anticipated and actually very well done. I wish we had not been so short on time, as there is a museum we missed. Believe it or not, the taxi driver only charged a total of $30 for the three-hour trip, including the difficult drive he made in the rain and, of course, waiting for us. We tipped him well. Travel tip: You don’t need to hire a tour guide to go here. Just hire a driver. We were flying to Guayaquil the next morning so this evening was the last in our quick stopover in Quito. Had we stayed another day or two, we could have taken in a cooking class, gone to see hummingbirds at the Yanacocha Preserve, visited a famous market and followed the Chocolate Trail. Check out the Discover Ecuador website to see these tours and many more escorted by Tropics. Founded in 1994, Tropic Journeys in Nature is an award–winning ecotourism company specializing in responsible, community-based tourism through high-quality operations and exceptional service in Ecuador. Guests visit the most spectacular natural areas of the country in the company of its native peoples, practicing the philosophy that one of the best ways of conserving an area – whether it be the Ecuador Amazon, the Galapagos Islands, the high Andes or a cloud forest – is to engage the participation of native, local people in creating the magic of an eco-vacation. Locals’ vested interest in travelers’ experiences assists the goal of preserving their culture and landscape. Programs combine life-changing, active-but-cultural ecotourism experiences focusing on nature, conservation, diversity and sustainability. Disclosure: My trip to Quito was self-funded, but the tour of Quito was provided complimentary by Tropics.